Designs by Lisa Somerville: ISC Challenge - What Size is your Art? ISC Challenge - What Size is your Art? This weeks challenge is to create an ATC (2-1/2" x 3-1/2"), Moo Card (1-1/8" x 2-3/4") and an Inchie (1"x 1" piece). Simply create your pieces using ISC images only - upload your project to your blog (or if posting to SCS please use keyword ISCC11), then leave a comment on the ISC Blog with a link to your card. A random name will be chosen and announced on the ISC blog! The winner will receive a $25 Shopping Spree from ISC! Entries must be posted by August 24. Lisa - these creations look beautiful!!! Beautiful challenge are! 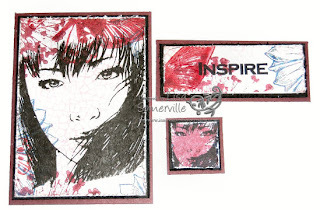 Love this girl image and the way you incorporated other stamps with it!